In the past few weeks, thousands of teachers in Oakland, California, went on strike, following similar protests in Denver, Los Angeles, and West Virginia. We are only three months into 2019 — and teachers have already taken to the picket line four times this year. In response, some critics have condemned these protests, chastising teachers for deserting their classrooms and even proposing that they serve jail time or lose their certification. But these critics are missing the point. Rather than take aim at our nation’s teachers, this should be a wake-up call. These strikes are the symptom of a larger disease within our education system, where the support our students and teachers are receiving is as crumbling as the infrastructure of the schools. In my work, I review hundreds of grant applications from teachers across the country. Their stories of need are heart-wrenching and make it hard to fathom how a student could thrive, let alone focus, in the current conditions many schools are facing. Low-income students have limited access to STEM classes, as participation would require them to purchase their own school equipment. One Pennsylvania educator described being forced to move classrooms four times because of mold that posed dangerous health threats, each time losing important science equipment, such as glassware and digital scales. Some teachers cannot even meet state curriculum requirements because they lack the resources to give students hands-on learning experiences, leaving them with gaps in their education on vital topics like biology and chemistry. 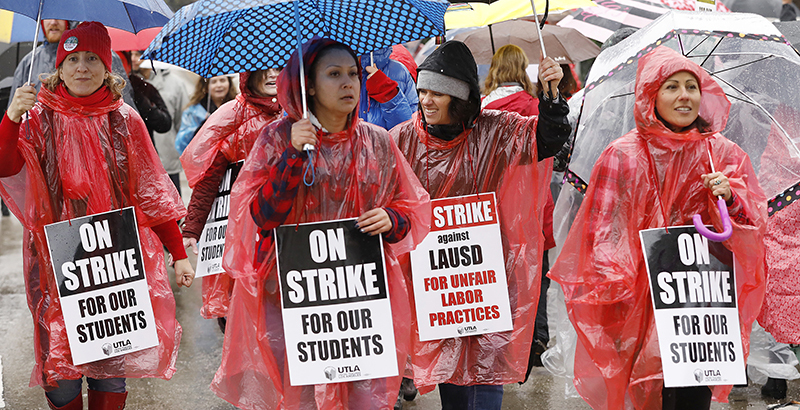 The strikes prove that our educational system’s problems are deeper and broader than individual protests about teacher wages and benefits. Everywhere, America’s schools are pressed for resources and facing dire conditions that unfairly hinder students’ ability to succeed. We are at a tipping point. If I have learned one thing from reading teachers’ testimonies year after year, it is that conditions in our nation’s classrooms are only getting worse. Our lawmakers are not adequately investing in education. Following the 2008 recession, many states sacrificed school funding in an attempt to make ends meet. However, in 29 states, total state and local school funding combined fell over the next eight years. And it still remains far too difficult for schools to get the funding they need from all levels of government. Just recently, we learned that $62 million allocated to build a Kentucky middle school that serves the children of military families may now go to fund the border wall. While these political battles carry on, teachers and students — our nation’s future leaders and innovators — are suffering. It is an unbelievable irony that thousands of teachers are striking in Oakland, a community adjacent to the world’s most influential and innovative tech hub. We cannot continue to innovate and advance in science, technology, engineering, and math, or in any field, without education. U.S. STEM jobs are projected to grow twice as fast as those in other fields, and we are nearing the point at which many may go unfilled. We must invest in educating the next generation to continue progressing as a society, to maintain our economic growth and competitiveness, and, most importantly, to be able to address and solve the numerous challenges facing our world — from climate change to cyberterrorism – before it is too late. Over the past several decades, the average pay for teachers has dropped in some states, and a survey last year found that 94 percent of U.S. public school teachers paid for school supplies without reimbursement during the 2014-15 school year. These factors have created a pressure cooker of frustration, burnout, and anger, making it easy to understand why teachers are walking out of their classrooms and demanding better from our lawmakers. It is amazing what the right resources and funding can do for schools. But support cannot come solely from nonprofits and donors. Our lawmakers must make education a priority. Tomorrow’s innovation, advancement, and leaders depend on it. Maya Ajmera is president and CEO of Society for Science & the Public and the publisher of Science News.